I have Yahoo mail and lost the cell phone that was registered to receive the code to sign into my email instead of using the password. I just keep getting into this endless circuit and cannot update the cell phone either. I have a new one with a different number. How do I either disable account key or update my information? If you setup a recovery email address (other than your yahoo account), you can have the reset password email sent there. Just type that recovery email address when you go through the "Trouble Signing In?" link on the generic Yahoo services login page at https://login.yahoo.com. Outside of that, you can try signing in from a computer that might have the yahoo account previously registered/saved. Otherwise, you may be out of luck. 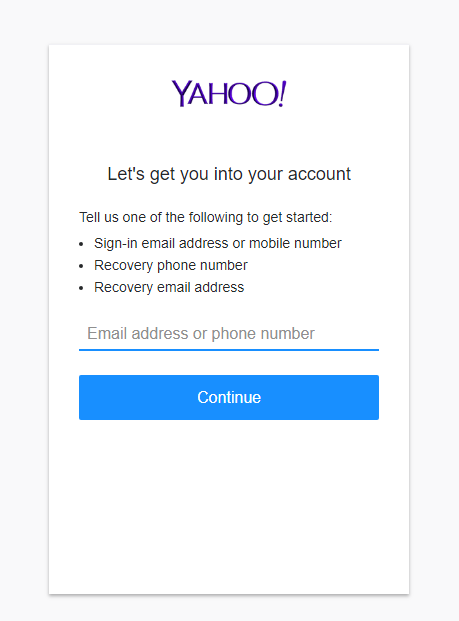 According to Yahoo's help page [https://help.yahoo.com/kb/account/fix-problems-signing-yahoo-account-sln2051.html] "If your recovery info is wrong or inaccessible, you won't be able to regain access to your account again"
Not the answer you're looking for? Browse other questions tagged yahoo-mail or ask your own question. How to get saved password from POP3 account in Gmail? How can I fix a WiseStamp signature which disappears from Yahoo mail? How to unlock and change Yahoo Mail password?